When to Harvest: Anytime of year - highest amounts of arbutin is found in the Fall. Keeping in mind that Bearberry grows quite slowly and to only harvest the leaves and not the stem in order to ensure growth and sustainability of the Plant. Alternatively (as gathering single leaves is quite time consuming), gather just 6-8 inches of the stem at a time. Bearberry can root from the wandering stems, so ensure you aren’t destroying the root system if you harvest longer pieces. Do this by just gently pulling on a branch, if you feel resistance, stop pulling - it likely has taken root. Bearberry is pretty intolerant of root disturbance. Suggested to wait three years before harvesting from the same patch of Bearberry again. 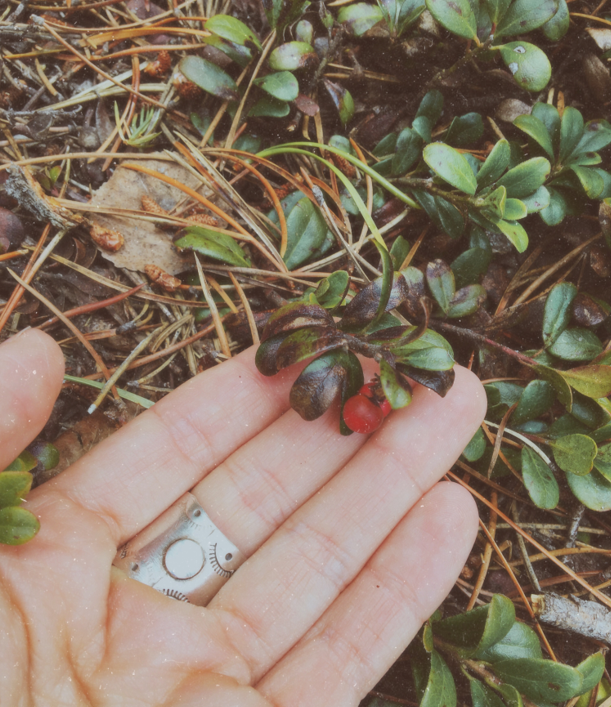 Ecological Considerations: Bearberry leaves are a winter food source for many forest friends, and the fruit is a starvation food for Bears — more reason to not over harvest a patch and to be mindful of who you are sharing the land with. Safety: Not safe during pregnancy. Bearberry, Uva Ursi, Kinnikinnik - all names used to identify this low lying evergreen shrub that tends to grow in rocky soil, especially in mountainous regions. Bearberry is best known as a ‘Urinary herb’ that is anti-septic to the Bladder and Urinary tract. This indication, though powerful and widely known, has always felt like just part of the story to me. I have spent much time playing with Bearberry in the Beartooth Mountains of Montana, where I grew up. As I deepened into my plant path I began to get more curious about why I’m drawn to this beautiful creeping shrub, and so, I dug deeper. Bearberry has traditional use as a smoke medicine among many Indigenous people, often mixed with other herbs to make a blend called Kinnickinik. This is also where Bearberry receives one of it’s other names - Kinnickinik. As a Smoke Medicine, Bearberry acts as a conduit for sending intentions/prayers to the Spirit world, and offering direct connection & communication. Burning Bearberry as an incense, or Smoke Medicine, is one of my personal favorite ways to connect to this Plant being. It evokes a sense of boundaries, protection, opening gates of perception, as well as connecting me back to the Mountains where I gather them (Apsáalooke Land). Bearberry has also been used as a decoction, or tea, for those with diabetes mellitus. Perhaps working through the affinity to the kidneys and bladder, and perhaps having an overall tonifying effect on the pancreas and liver (through the high tannin & anti-inflammatory processes) - though this is a traditional use, I could not find any supportive research studies. Due to the high amount of tannins (and hence astringency) Bearberry is helpful for toning and tightening mucous membranes - with a particular affinity to the uterus and urinary tract. For this reason they may be helpful for postpartum support, to help tone the uterus as well as help to stop excess bleeding after birth. They also make a lovely sitz bath, blended with other vulnerary & calming herbs like Yarrow, Plantain, Lavender and Rose for a healing bath. Bearberry can be worked with for menorrhagia, or heavy menstrual bleeding, as well as menstrual pain that is due to a lax uterus. It makes sense then that Bearberry may also be helpful in cases of uterine prolapse, and mild bladder prolapse. Getting back to Uva Ursi’s main use today as a urinary anti-septic - let us look at the theory that the urine must be alkaline in order for Uva Ursi to fight pathogens. The theory behind this comes from the pharmacokinetics of one of Bearberry’s active constituents: arbutin. Arbutin is absorbed through intestinal enterocytes, passed through the liver, where it is deconjugated & reconjugated, then processed through the kidneys, and broken down into a hydroquinone (which is anti-septic), in alkaline urine (with more steps and compounds than listed here). Without an alkaline environment it would seem that arbutin cannot be converted into hyrodquinone. This suggests it would not be effective as a bacteriostatic agent unless exposed to an alkaline environment. However research is mixed. There is also a minor pathway where arbutin is converted to free hydroquinone in the colon by bacterial betaglucosidase, then reabsorbed into the bloodstream and passed through the kidneys. Normal urine is usually slightly acidic, with the range varying from 4.5pH to 8.0pH and varying throughout the day, going from acid to basic. Those who eat a more plant based, and vegetarian diet will have a more alkaline urine than those who consume a lot of meat. Common pathogens that cause urinary tract infections (UTIs), such as E.Coli, make the urine even more acidic. Though some pathogens, such as Proteus spp. and Klebsiella make the urine more alkaline. Seeing as Uva Ursi has been used for longer than we have had the ability to test for acid/alkaline urine, it likely is still beneficial for those with ‘normal’ (ie slightly acidic) urine as well. Some herbalists still choose to give Uva Ursi with things like sodium bicarbonate to make the urine more alkaline, but this practice should be done with care & consideration. Typically studies have shown that the highest bacteriostatic effects of Bearberry occur around 3-4 hours after ingesting the herb. Bearberry is also helpful for h. pylori infections in the gastrointestinal tract. The tannins in Bearberry not only heal the mucosa (ulcerations), but also act as an antibacterial agent to 10 strains of h. pylori. Bearberry was also found to have a protective effect on the gastric mucosa as well. Bearberry can also act synergistically with steroids, both internally and topically, potentially increasing their effectiveness at reducing inflammation and swelling. Adding a tincture of Bearberry with prednisone or dexamethasone in clinical studies did not increase the side effects of the steroids; however, it did increase their effectiveness. Bearberry is also used in cosmetics for skin hyper-pigmentation as an alternative to hydroquinones, which have been shown to increase inflammation and have potential to cause cellular damage. Arbutin is a powerful skin lightener, and most companies use an extract of arbutin from botanicals such as Bearberry for skin lightening effects. This may be helpful for reducing the appearance of age spots, as well as hormonal skin issues such as melasma. Keeping in mind that larger doses (concentrations of the extract) and longer term use may still be associated with rebound hyper-pigmentation and skin irritation. A last note on the clinical application of Bearberry - many texts suggest not to work with Bearberry long term; however, it should be noted that in traditional Indigenous medicine Bearberry is worked with long term as an infusion. It is even suggested to drink a mild cup a day to keep the kidneys and tissues functioning properly. Perhaps this is due to the dose being lower, and the infusion time being less as well. I wouldn’t suggest the use of Bearberry at high doses long term, but it is an important note nonetheless. Bearberry is an important herb to many peoples, particularly Mountain dwelling folks all over what is now the US, Canada, Asia and Europe. As mentioned, it has been (and is) worked with as a smoke medicine, both internally and externally as a purification smoke. Often times it is mixed with tobacco or other herbs for smoking internally. For burning ritually, it is worked with as a shapeshifting, or visioning herb. One that helps to change our physical selves in other realms, in order to gain insight/wisdom/healing/etc. If this sounds ‘out there’ consider any dreams you’ve ever had in which you may have received some insight. Your intuition and guides speak through many ways - and Plants are often helpful allies to be the translator or spark we need. Bear is one of the animal guides that helps link us to the Plants and the Earth. A natural guide for any herbalist, or Earth tender. Bear Medicine is also very protective, think of a Mama Bear with her cubs. We can call on Bear Medicine when we want to connect with the Natural Elements, and also when we might need to strengthen our boundaries. Boundaries can refer to both external and internal boundaries. We need both. Internal boundaries are important so that we aren’t ‘leaking’ our energy out into the world, onto our partners, children, family members, etc. Internal boundaries ensure that we are aware of our own energy and honor other’s space. External boundaries are important so that we don’t take on the problems/feelings/thoughts/physical complaints of others. We often think of these types of boundaries for sensitive souls and empaths who tend to feel other’s energy deeply. Seeing as Bearberry often grows in the Mountains, I see them as being a Mountain Spirit Herb. One that allows us to connect to the energy of the Mountains. I look to Bearberry for being able to have clear vision and insight, when I’m working with an issue or life situation I might need guidance on. Also, again, for protection and clear boundaries. You can burn dried Bearberry leaves on a charcoal disc, or you can make an infusion and pour it into your bath water to energetically cleanse with them and strengthen auric boundaries. A bath with Bearberry can also can also help heal physical wounds due to the astringency - just be sure to moisturize after as the tannins can dry out the skin. You can also add the dried leaves to herbal smoking mixtures to create your own kinnikinnik blend. A lovely mix might include: Bearberry, Sweet Clover, and Mullein leaves. Growing so close to the Earth, I invite you to come down here, place your hand onto the Land while you bring your entire being next to me to gather. In this way, I connect you to the energy of the Earth, the Plants, and your own Wild Nature. I remind you that you are not separate from Nature, you are one with all that is. Expanding your heart energy to radiate love, both to others and also to yourself. I protect your water sources, healing the water ways in your body - as well as helping you to remember that the Earth’s water ways need healing and protection as well. Work with me to connect to the Plant Spirits, to vision, to strengthen your boundaries, to protect, but also to ignite your own Protective Spirit that cares for the Earth and all of her creations. Be mindful to offer gratitude and reverence, and to not take more than you may need - in all areas of your life. Jacqui is a Herbalist, Naturopathic Graduate, and a Steward of the Earth. She is passionate about sharing knowledge & wisdom of Earth based practices, plant medicines, medicine making, ancestral reverence, moon cycle medicine, postpartum support, and Earth tending (gardening) - to bring a sense of connection & community into our daily lives. She practices Ancestral reverence & Medicine, and is Mixed Indigenous. By tending to the Earth and working with Plant Medicines from a place of respect, Jacqui holds space for deepening connection to oneself, ones intuition, and the healing power within. Connecting to Plants in this way deepens the relationship with the Ancestors, the Land, the Animals, and fellow humans - to offer deep healing for all of our relations. When we heal ourselves, we heal the Earth. And when we heal the Earth, we heal ourselves. Jacqui's highest intention is to help you remember your connection to the Earth, and to help you reclaim your inherent light & Medicines within, to bring forth healing for all. To remember that you are also part of Nature and not separate from it. With an open heart, roots in the Earth, and anchored to the stars - let us walk this road together. Find Jacqui on Instagram @among_the_wildflowerss for her current in person workshops, and online courses, including Grow Your Own Medicine.